Full of love. 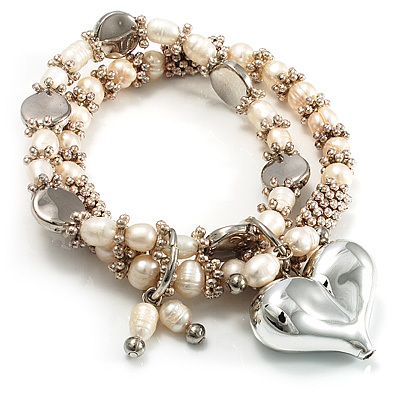 You'll fall for the precious design and lustrous shine of this sweet 2 Strand Freshwater Pearl Puffed Heart Flex Bracelet. Featuring a 2 strand flex design, made of ivory coloured freshwater pearls mixed with silver tone metal beads. The large puffed heart charm dangle in the middle of the bracelet, attached with an oval link. Flexible design ensures the perfect fit. Fits up to 19cm. Fantastic gift idea for the ladies - mothers day, Christmas, birthday, anniversary, wedding, bridesmaid or why not just treat yourself!